Since last Wednesday (September 7th) Mark and I have done 21 SUMO flights on 5 flight days. For our first two flight days (September 7th and 8th) we were flying in the afternoon and early evening. A zoomed in photo of the SUMO in flight over the Pegasus runway. 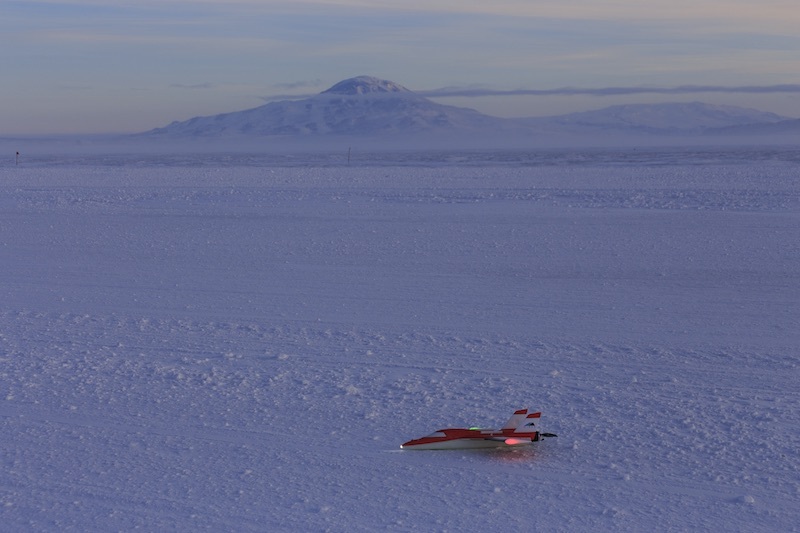 A SUMO UAV sitting on the Pegasus runway after a successful flight. Mt. Discovery is in the background. Starting on September 10th we switched to doing overnight flights. For these we start our flight operations around 9PM and end around 5 or 6AM, so all of these flights are done in the dark. 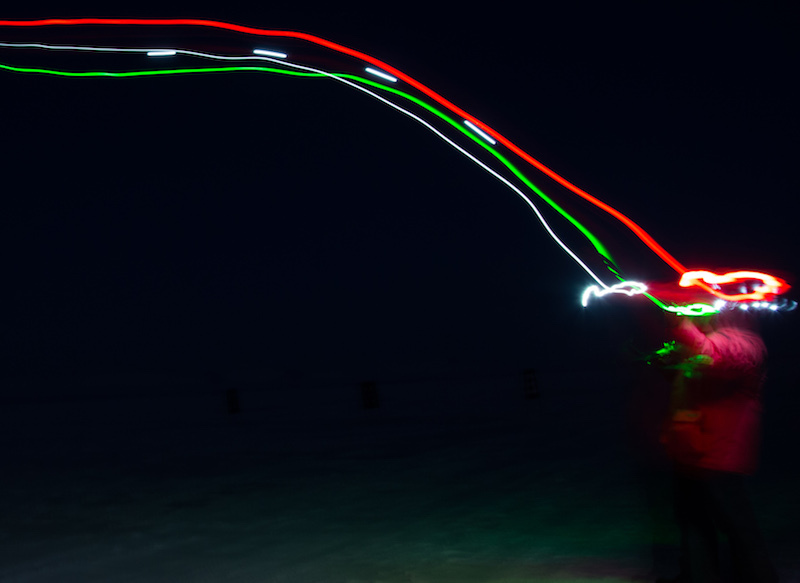 The SUMO is equipped with several lights to make it visible for night flights. There is a bright white light on the nose of the plane, a flashing white light on the tail, and green and red lights on the wing tips. These different color lights allow us to easily see the plane’s orientation even in the dark when we can’t see the shape or outline of the plane itself. 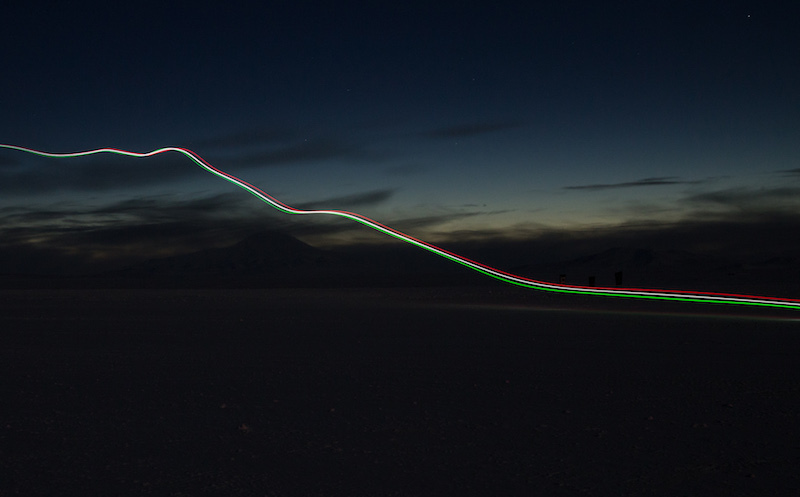 Part of our reason for coming to Antarctica at this time of year is that there is still light and dark periods each day, just like at home. 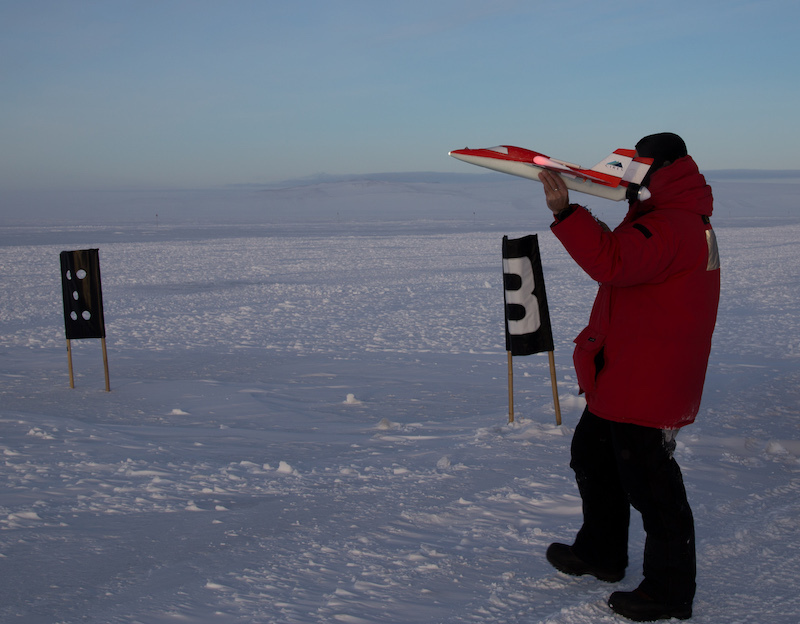 The atmospheric boundary layer, that is the focus of our work, responds to these changes in incoming sunlight or darkness and we’d like to observe this response with our SUMO flights. The biggest difference between light and dark periods is that during the day the sun heats up the ground, even in Antarctica, and the ground then warms the air in contact with it. As you move away from the ground the temperature decreases with height. At night, the ground loses energy to space and cools off. The cold ground takes heat from the atmosphere and the coldest air is found right next to the ground with temperature increasing as you move up away from the surface. This is called a temperature inversion and is a characteristic of the nighttime atmospheric boundary layer. 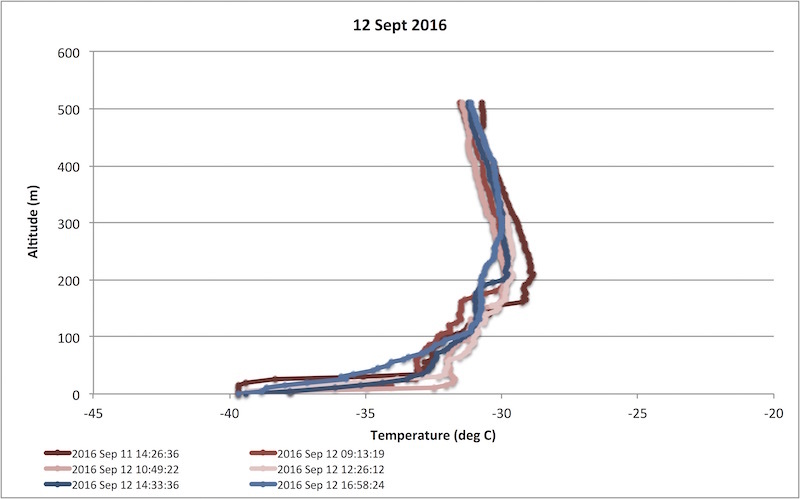 Temperature profiles observed by the SUMO UAV on the night of September 12th. The temperature in these profiles increases almost 20 deg F from near -40 deg C (also -40 deg F) at the surface to -30 deg C (-22 deg F) at 200 m (600 feet) above the ground. This is a stronger temperature inversion than we normally see in more temperate locations like the United States. Although it was hard to get our bodies onto a schedule that had us awake all night I do like being out doing our flights during the night. There is no one else around at the runway and we get a beautiful view of the starry, cold, Antarctic night sky. 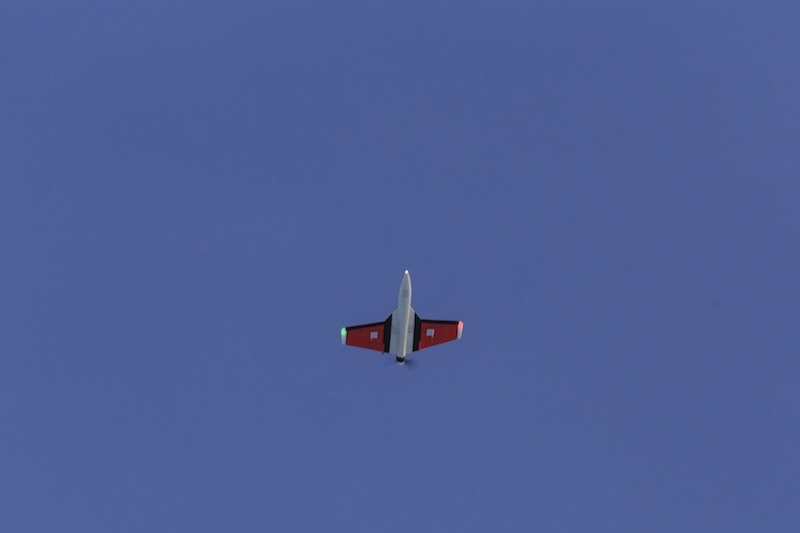 A SUMO UAV circling over the Pegasus runway. 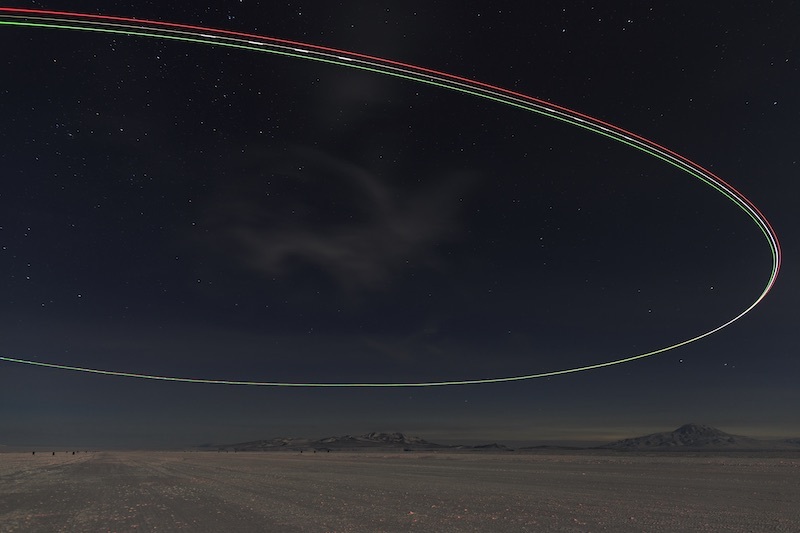 The green line is from the right wingtip light, the red line is from the left wingtip light, the solid white line is from the nose light, and the dashed white line (overlapping the solid white line) is from the flashing tail light. The SUMO’s trail of lights encloses a cloud that formed during the flight. Black Island and Mt. Discovery are visible in the background. While we were watching the SUMO during a flight on the night of September 11th we were treated to seeing one of the brightest shooting stars I’ve ever seen. As the meteor flashed down across the sky it broke up creating a trail of bright flashes that turned from white to pink as we watched it. I had hoped we’d see the Southern Lights during our night flights but so far we haven’t been lucky enough to see them, although I have seen them twice from in town. I’ll post photos of them in a later blog post. 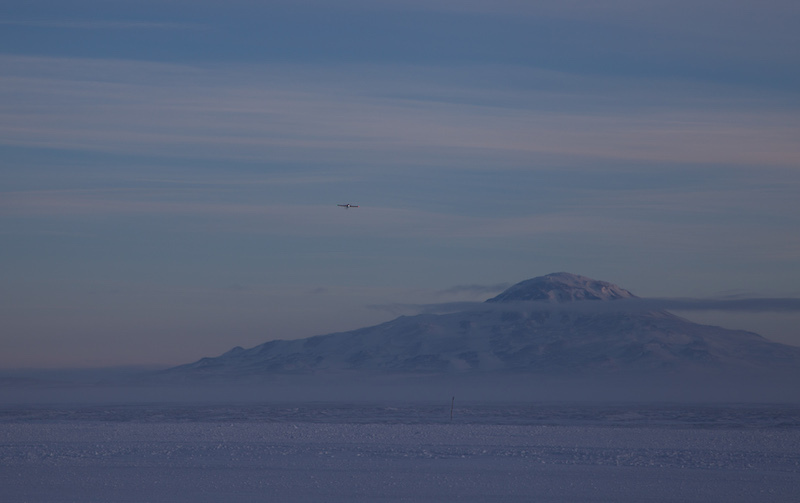 The weather has continued to be cold with high temperatures in McMurdo around -20 deg F and low temperatures around -30 deg F. It has been even colder on the ice shelf where we are doing our flights. All of flights have been done in temperatures from -35 to close to -50 deg F. The winds have been pretty light so those cold temperatures haven’t been too hard to deal with. We also wear a lot of cold weather clothing. In fact, the cold weather gear we wear when doing fieldwork weighs almost 17 pounds. A lot of the weight in our cold weather gear comes from our heavy parka and boots. 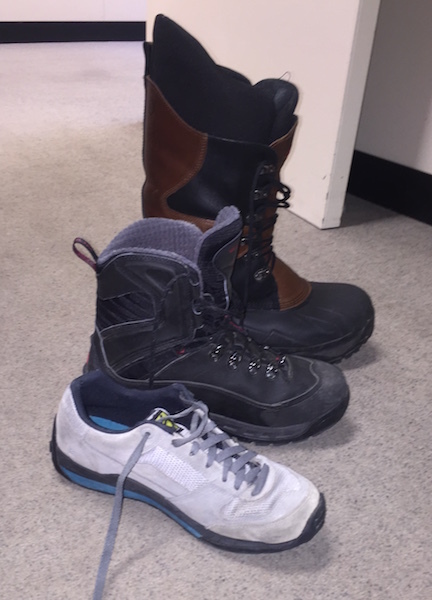 Here you can see how big our boots are compared to my normal shoes (front), my “heavy duty” winter boots that I wear on the coldest days back in Colorado (middle), and my Antarctic boots. We won’t be flying for the next few days as a couple of storms are forecast to pass through the area. It is always frustrating to not be able to make the measurements we’ve come down here to collect but as someone that really loves experiencing extreme weather I’m excited to experience these storms. Hopefully, we’ll get some exciting weather with them that I can share in my next blog post.